Switchgear Market size in 2017 was valued over USD 90 Billion and is estimated to witness growth over 6% by 2024. Increasing expenditure toward infrastructural development along with regulatory measures for the expansion of power grid in rural areas will enhance the market size. Re-installation of T&D networks across war-affected nations in Middle East will further propel the product demand. For instance, in 2017, Japan announced to allocate USD 16.7 million for the United Nations Development Program (UNDP) in Iraq. The program focuses toward promoting resilience building, stabilization and rehabilitation of infrastructure for refugees. Exponential rise in electricity consumption coupled with increasing concern toward the upgradation of aging power grid will augment the global market size. Blackstone Group LP, in 2017, declared an allocation of USD 100 billion toward the restoration of aging infrastructure across the U.S. The monetary allocation is supported by the Saudi Arabia Public Investment Fund and falls under the Strategic and Policy Forum. Low Voltage (LV) switchgear market size is anticipated to surpass USD 70 billion by 2024 on account of its wide applicability across power sector and process industries. Favorable power distribution reforms along with increasing demand for low voltage smart control systems will further nourish the industry growth. 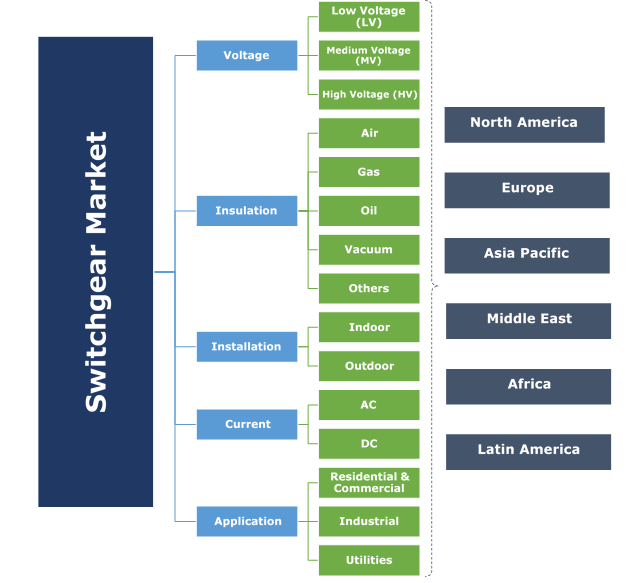 High and Medium Voltage switchgear markets are projected to witness appreciable growth on account of rapid commercial and industrial establishments. Expansion of transmission and distribution networks coupled with flexible product applications across primary and secondary distribution channels will further augment the business landscape. EverSource Energy, in 2016, declared to invest about USD 900 million toward restoration of transmission networks across the U.S.
Air insulated switchgear market size will grow on account of low capital investment and comparatively effective operational safety. Rising investments toward technological and product performance enhancements will further complement the industry outlook. In 2017, gas insulated units held over 15% of the global industry share. Minimal maintenance, low space requirement, high dielectric strength and improved reliability are the key parameters which make its deployment preferable over other available alternatives. 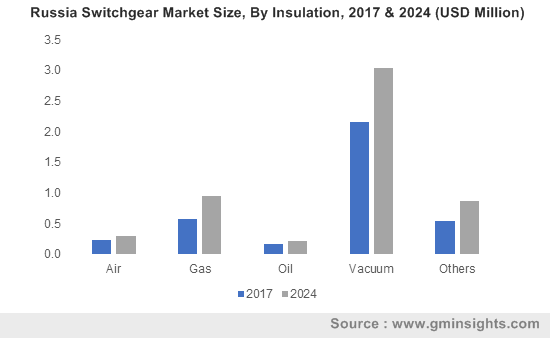 Vacuum insulated switchgear market will grow on account of its flexible power frequencies and high impulse withstand voltages. Noise and pollution free operation coupled with actuation and ease of timing will further boost the product penetration. Indoor switchgear market is anticipated to reach over USD 25 billion by 2024. Enhancing real estate sector subject to growing private investments will complement the business landscape. Increasing space constraints along with growing focus toward energy effective distribution networks will further augment the product penetration. Nokia and Elisa, in 2017, collaboratively introduced the Smart Tampere project in Finland for providing remote assistance through smart lighting, video and actual public transport information system. DC switchgear market is anticipated to grow on account of increasing demand for HVDC systems along with comparatively quicker lead time requirement. Provision of an effective interconnection support for alternating current circuits favored by operational flexibility will further stimulate the business landscape. General Electric, in 2017, announced to establish a medium voltage DC transmission link to convert an existing 33kV alternating current operation to direct current circuit across Norway. In 2017, commercial and residential applications accounted for over 20% of the global switchgear market share. Government assisted residential sustainable infrastructure establishments along with rapid urbanization will enhance the industry growth. Perpetual smart control networking initiatives favored by complementing distributed generation technologies will further escalate the product demand. Rising concern toward energy efficiency and increasing focus toward integration of various frequency transmission links will boost the industrial switchgear market. Increasing community-based electrification programs along with growing private investments from institutions including Asian Development Bank, International Finance Corporation and World Bank will complement the utility switchgear industry. For instance, the World Bank, in 2017, declared to invest USD 23.3 million toward the development of power infrastructure in Africa. The U.S. market in 2017, was valued over USD 10 Billion. Regulatory initiatives toward upgradation and replacement of aging electrical network along with rising demand for cost effective technology will propel the business outlook. The U.S. Federal Transit Administration in 2017, declared an investment of USD 647 million toward the Peninsula Corridor Electrification Project to electrify the corridor from San Francisco to Tamien. Egypt market is anticipated to witness growth over 10% by 2024. Increasing demand for power coupled with rising investment toward adoption of renewable energy will enhance the business outlook. As per a leading publication, Egypt in 2015, witnessed a funding of about USD 14.5 billion toward establishment of an effective and sustainable power grid infrastructure. Eminent participants in the global market include Mitsubishi Electric Systems, Schneider Electric, Toshiba, ABB, GE, Siemens AG, Larson & Turbo, Hitachi Ltd., Crompton Greaves, Hubbell, Powell Industries, BHEL, Hyosung, Rittal, Hyundai Ideal Electric Co., Meidensha Corporation, Fuji Electric, Iljin Electric and Ormazabal. Shift toward packaged switchgear technology along with custom-made product specifications for flexible applications have instituted a competitive industrial landscape. Quicker lead time coupled with effective engineering and technical support further augment the business outlook. Switchgear breaks, makes and carries the normal current load and clears the electrical fault coupled with metering and regulating of various parameters across the power system. These products are utilized by industrial, utilities and residential customers across high, medium and low voltage applications.